Belmont University College of Law, in conjunction with the Nashville Bar Association and the Jewish Federation & Jewish Foundation of Nashville and Middle Tennessee, is proud to present Lawyers Without Rights. at Belmont University in Nashville, Tennessee, May 17, 2018. 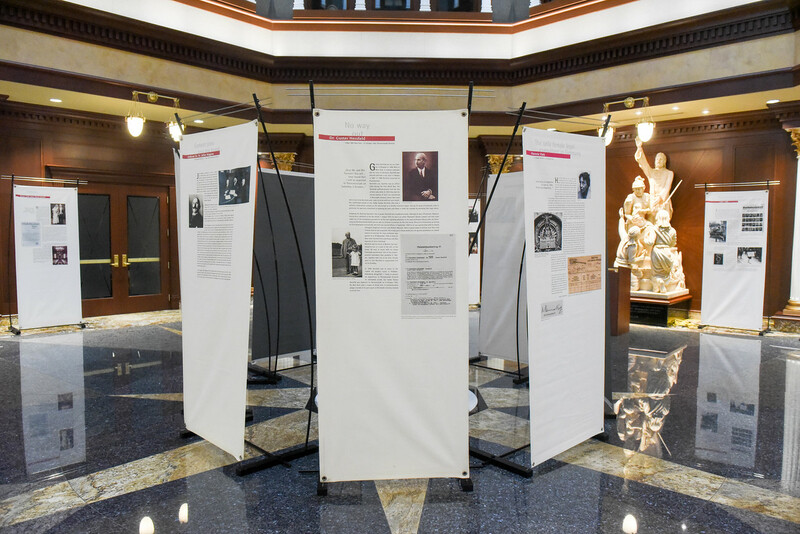 Belmont University College of Law is currently hosting an acclaimed international exhibit that features photos, documents and written narrative that convey the stories of Jewish lawyers, many of whom were among the first purged in Nazi Germany. The exhibit—which has been displayed in more than 100 cities in Germany, the U.S. and other parts of the world—is available for viewing now through Friday, June 1 in Belmont University’s Baskin Center, home to Belmont Law. In fall of 2012, the German Federal Bar and the American Bar Association agreed to jointly sponsor the North American showing of the exhibit, “Lawyers Without Rights: Jewish Lawyers in Germany under the Third Reich.” The idea for the exhibit was conceived in 1998 when an Israeli lawyer asked the regional bar of Berlin for a list of Jewish Lawyers whose licenses had been revoked by the Nazi regime. The showing at Belmont University College of Law is sponsored by Belmont University, the Jewish Federation and Jewish Foundation of Nashville and Middle Tennessee and its Community Relations Committee, and the American Bar Association in conjunction with the German Federal Bar, the Nashville Bar Association and the Harry Phillips American Inn of Court. Parking is available in the Baskin Center Garage, which is beneath the building and accessible via Acklen Avenue. The German Federal Bar, known as the Bundesrechtsanwaltskammer, is the national bar of the Republic of Germany and based in Berlin. Membership is approximately 166,000 lawyers and is required of all licensed lawyers in Germany. The American Bar Association is a voluntary organization of more than 400,000 members and based in Chicago. There are two identical exhibits now traveling throughout the United States and other parts of North America. Since the agreement was developed between the two bar associations, the exhibit has appeared in more than three dozen cities in the United States.